John Plumb studied at Luton School of Art, the Byam Shaw School and at the Central School under Anthony Gross, Victor Pasmore, William Turnbull and Keith Vaughan. He was represented in the AIA abstract exhibitions of 1953 and 1957, in Situation exhibitions 1960 -1961, and with Bridget Riley, William Turnball, Robyn Denny and notable others and in a group exhibition, 1961. Subsequently he was included in British Painting 1974, at the Hayward Gallery, and in Art & the 60s: This Was Tomorrow, Tate Britain, 2004. He taught at various art colleges, becoming became Senior Lecturer in Painting at the Central School of Art and Design, London 1969-1982. 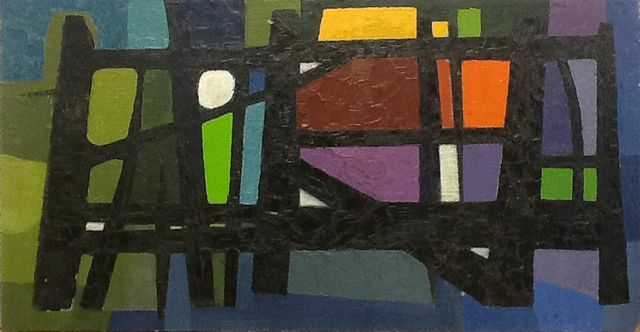 His first one-man exhibition was at Gallery One in 1957. He subsequently exhibited at Marlborough and Axiom Galleries, followed by solo exhibitions throughout the UK, including Arnolfini Gallery, Bristol.